This set first appeared on the Teldec label in the early 1990s, and has been available on lower-price release before this Apex edition, receiving, as runner-up, mention in the budget section of one of BBC Radio 3’s ‘Building a Library’ reviews, in this case concentrating on Le Sacre. I suspect a recommendation would always be in order with this release considering the amount of ‘filler’ material you receive, that is, if The Rite of Spring is all you’re after. As recordings it was however more the ‘budget’ aspect of this set which drove most of my positive considerations – it’s not bad, but strictly speaking, it’s not that great either. The recordings are modern – dynamic and clean as you’d expect. There is an element of artificiality about the mixing which made me a little uneasy on more than one occasion. Cymbals and percussion which leap out at you and tambourines being shaken under your nose in Petrouchka for one thing, and winds which sometimes seem to be in a jumbled heap in Le Sacre. There are some funny edits as well, with a truncated piccolo 0:52 into ‘The Moor’s Room’ of Petrouchka and very strange squeaky one 2:38 into the Augurs of Spring (Le Sacre). Petrouchka works reasonably well, and there are some impressive moments – the crowd during the ‘Shrove Tide Fair (towards evening)’ is one such. The playing is OK in general, but you rarely get the sense of the whole thing gelling and becoming really inspired. Tempi are just a fraction slower than anything really exciting, and as a result the tensions and drama one hopes from this score are always a bit soggy and underdone. ‘The Dance of the coachmen and grooms’ for instance, has a leaden tread which never really takes off. The fairground barrel organ’s player seems rather sleepy as well, and if the strings’ entry is going to wake him up then it will only be to ask for a refund, or for some more rehearsal time in future. Stravinsky’s youthful Fireworks, a sort of “sorcerer’s apprentice meets the flight of the bumble-bee” is an enjoyable romp, which demonstrates the young composer’s skills in orchestration – the Philharmonia coming through the test pretty well, though the sterile studio environment doesn’t help things along much. Its earlier partner, the Scherzo fantastique, is another admirable apprenticeship, and the orchestra and conductor seem comfortable with its Tchaikovskian idiom at the conclusion to this well-filled twofer. Talking environments, the orchestra moves to The Maltings in Snape for Le Sacre du printemps. This is a bigger sounding barn for an altogether larger musical canvas, but with intonation as an issue from the start I was less than impressed with the ‘Introduction’. I’m not so sure the tempi are such a problem in this piece, and there is some wicked brass and some impressively recorded drum thwacks which will keep woofer-watchers happy. I just couldn’t quite square the circle as far as making this entirely convincing ballet music. I’m sure it would have made an excellent concert, but I somehow couldn’t quite ‘see’ the action developing in front of me. None of the more atmospheric rituals really thrilled or chilled me, but I do have to admit that the orchestra is in its element with louder climaxes, such as the rougher splendour of the ‘rival tribes’, although I did feel a little let down by the percussion later on in this movement – very ‘B movie’. I had a listen to Stravinsky’s own 1962 Columbia Symphony Orchestra recording, and was unsurprised to be reminded of the plentiful little crackses and oopses which crop up in this elder statesman of the catalogue. It is however notable how much more briskly the composer takes his orchestra through most of the music. 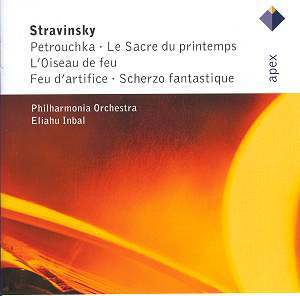 Inbal’s tempo makes that strange brass passage, 2:19 into the second Introduction sound like a wrong note – in Stravinsky’s reading it’s more of a blue one, and points to a more swinging sacrifice in general. Inbal’s Glorification of the chosen one is a hi-fi spectacular, but brutal and goose-stepping, where Stravinsky’s spirals and spins in a dizzying dance. Inbal and Stravinsky agree almost to the second in their timing of the final Danse sacrale, but the composer has his players screaming the tension, with a sense of suffering which always brings a lump to my throat. Inbal’s Philharmonia has a great deal of poise and rhythmic punch, but I know which one I’d pick for my desert island. The second disc of this set has the complete ballet, L’Oiseau de feu, whose composition preceded the Rite of Spring by three years, announcing Stravinsky’s arrival and confirming his status on the Paris scene. As with Petrouchka, there is a great deal of good playing here, but the whole thing just seems to lack that last ounce of oomph, the final lick of polish which would have made the lines shimming and luminous. On what do I base these vague criticisms? Sometimes, I admit, it is hard to pin down exactly. I still have issues with the recording, which spotlights too brightly on occasions. Again, comparing with Stravinsky in 1962 with the Columbia Symphony Orchestra, Inbal allows himself the indulgence of a generally lower set of tempi, so the proportion of the work tends to drag rather than sweep one along in a state of exotic passion. Stravinsky also shows how much more light and shade there can be found in the score, with moods dark and threatening contrasting with those quicksilver shafts of dancing light, driving the narrative on to beyond the players limits in places. We just don’t get that level of depth and excitement with Inbal. As a one-size-fits-all entry into the world of Stravinsky’s three great early ballets, I would say this set has the highest level of convenience to recommend it. The orchestral sound is detailed and indeed often spectacular, and less crusty and critical listeners will find a great deal to enjoy. I would however say that this is more like the version that you might snap up at the airport, rather than one you will have selected after careful consideration and comparison – one with which to travel, rather than to treasure: jet-set consumer Stravinsky, which is probably just what the publishers wanted.